NSBA Merit Award 2016 - Movable span - Memorial Bridge - New Hampshire / Maine. Winner, NSBA Award 2016 - Reconstruction span - Alexander Hamilton Bridge - New York. Winner, CISC Award 2015 - Engineering category - Lee's Avenue Bridge - Box girder bridge, Ontario. Winner, CISC Award 2015 - Bridge category - Des Allumettes Bridge - Box girder bridge, Quebec. Winner, CISC Award 2014 - Bridge category - Strandherd Armstrong Bridge, Arch bridge, Ontario. Winner, NSBA Award 2014 - Movable Bridges & Special Award for Accelerated Bridge Construction Commendation - Willis Ave. Bridge, New York. Winner, CISC Award 2013 - Bridge category - A30 PPP Beauharnois Canal Bridge - Giant box girders, Quebec. Winner, CISC Award 2013 - Engineering & Bridges Categories - Deh Cho Bridge - Cable-Stay Bridge, Northwest Territories. Winner, CISC Award 2011 - Engineering category - Cheticamp Bridge - Skewed box girder bridge, Nova Scotia. Winner, CISC Award 2011 - Industrial projects/bridges - Curved box girder bridge near Highways 640 & 15 - Quebec. Winner, CISC Award 2011 - Outside Quebec projects, Willis Avenue Bridge - Swing Bridge - Machinery and Structure - New York. See Projects tab for pictures. 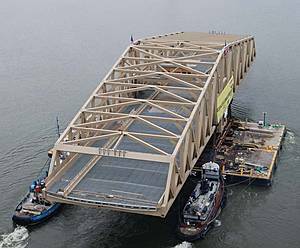 Winner, NISD Award 2008 - Project of the year/Bridge - Triborough Bridge - Prefabricated Deck Panel Replacement - New York. Winner, CISC Award 2008 industrial projects/bridges for the Park Bridge, Kicking Horse Canyon, phase 2, in British Columbia. See Projects tab for pictures. Tenca Steel Detailing, Inc. is a professional firm specialized in detailing steel bridges of all types. We adapt our work according to your manufacturing needs.